Humidity hung in the air like the memory of a distant task unaccomplished. It weighed down the warriors hiding amidst the swamp and there was nothing they could do about it. They waited. After a campaign that had seen the Uluz driven from their villages they had retreated to this swamp and here their king had met Sredni Vashtar of the Silver Shields. Akahs had not known what to make the giant, metal clad warriors at first and assumed they were here to wipe him and his people out. Quickly it became apparent that they were not and King Akahs swore his loyalty to Vashtar for the salvation this man may bring to the Uluz. 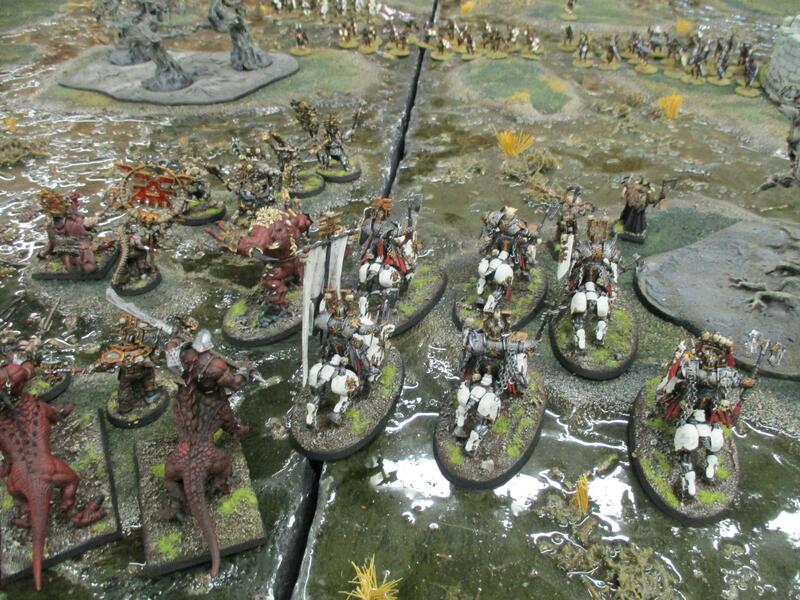 Ason-Har's forces had pursued them into the bog and were coming along. Now the Uluz, backed by the Silver Shields, would be ready for them. 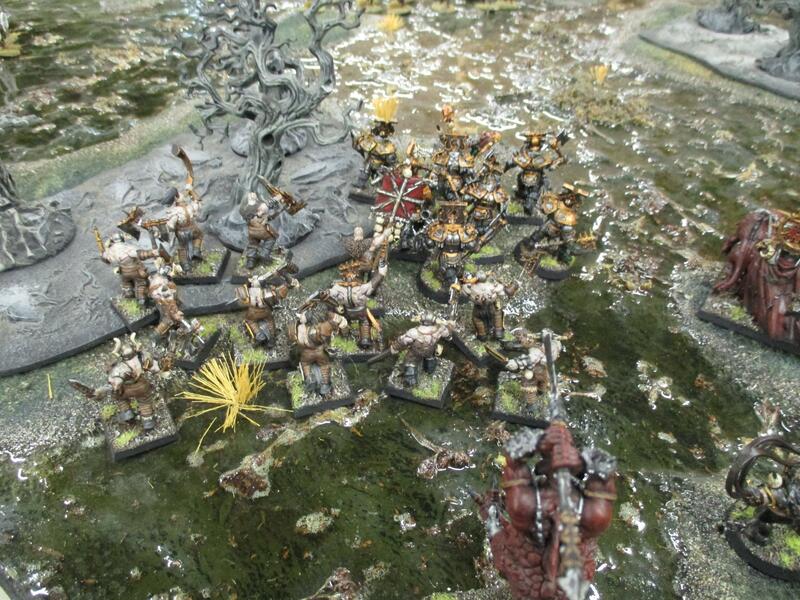 The Uluz forces were spread out in a rough semi circle waiting for the Khorne army to come stomping through. There was no subtlety to the movements of the Bloodbound forces. 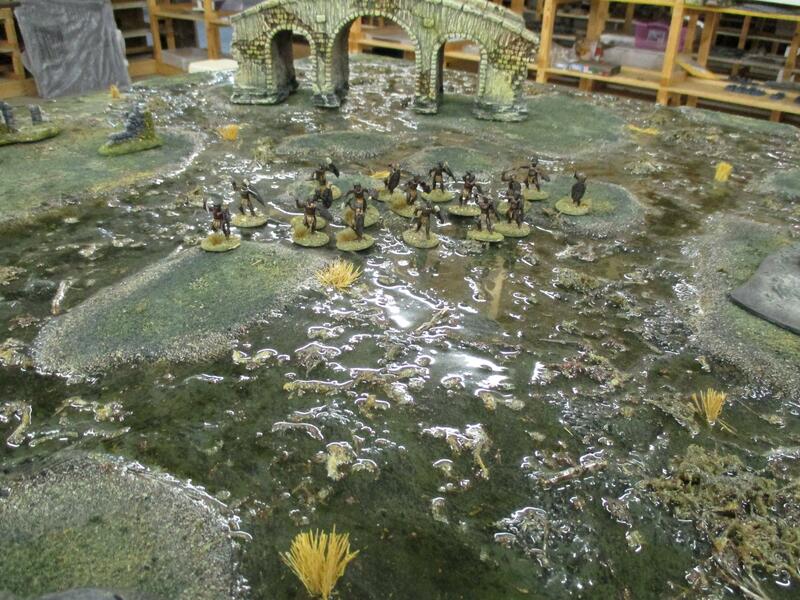 The jingling sound of metal on metal was audible above the splashing footsteps as the warriors moved through the swamp. The lead elements of the Chaos forces passed by where the Uluz had hidden themselves and the tribes men waited for the signal to attack. Akahs looked at Vashtar and waited too. Once the rear elements of the Chaos forces were past the forward parts of the Uluz positions Vashtar brought his hammer down heavily on a rock. The sound echoed through the murky darkness and as one the tribesmen leapt to their feet and charged towards the startled Khornate forces. 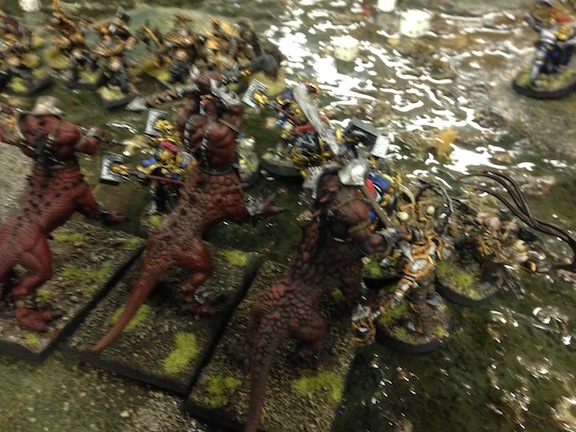 Only momentarily taken off-guard the Chaos forces charged right back at them. The savagery of their counter charge was blunted by moving through water in some places waist deep. Akahs appreciated the plan Vashtar had come up with. The forward elements would cut off the retreat of the Chaos forces while the central parts of his semi-circle would pry the vanguard of the enemy apart to create a gap for the Stormcast Eternals to exploit. It was not easier for the tribesmen to move towards their foes in that deep water. Still spurred on by the chance to avenge the loss of homes and loved ones they welcomed the coming struggle. The tribesmen quickly isolated a champion of the enemy and set upon him. Alone he may have been but Sarius was not defenseless. His axes swung around him with savage speed, few of the spears of the enemy could dart past them and of those few that did even fewer were capable of piercing the steel plates of armour that had grown to become a part of the man. 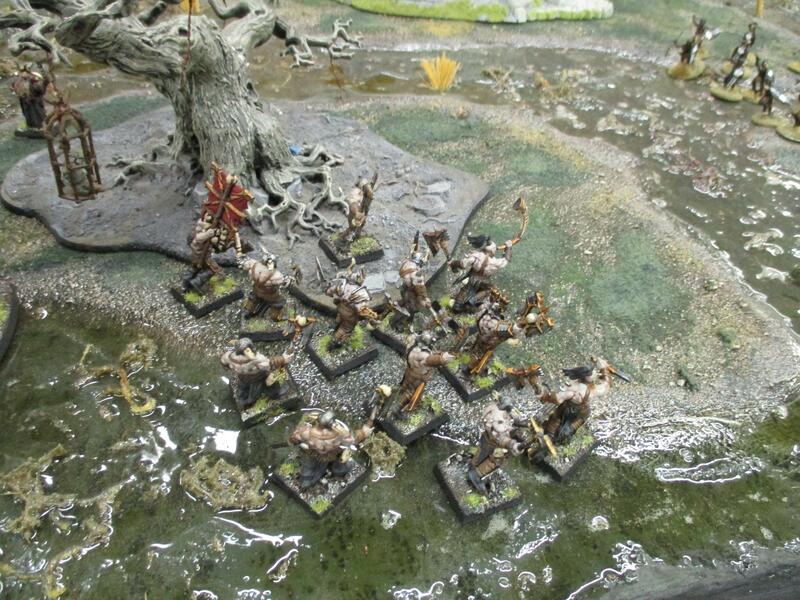 The skullcrushers were having more of a problem than most of the troops in navigating the marshy ground. 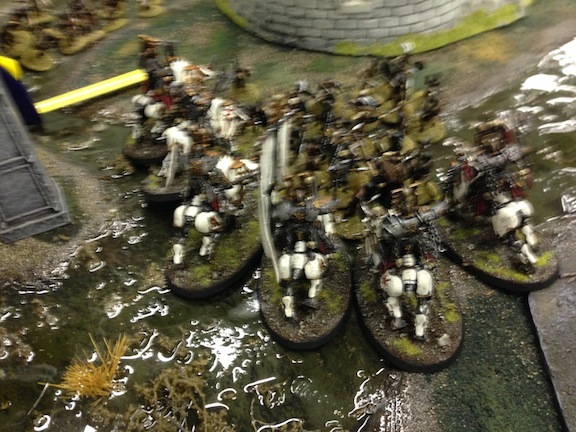 They moved up to help Sarius and stampeded into the ipmi attacking him causing great carnage in the ranks. 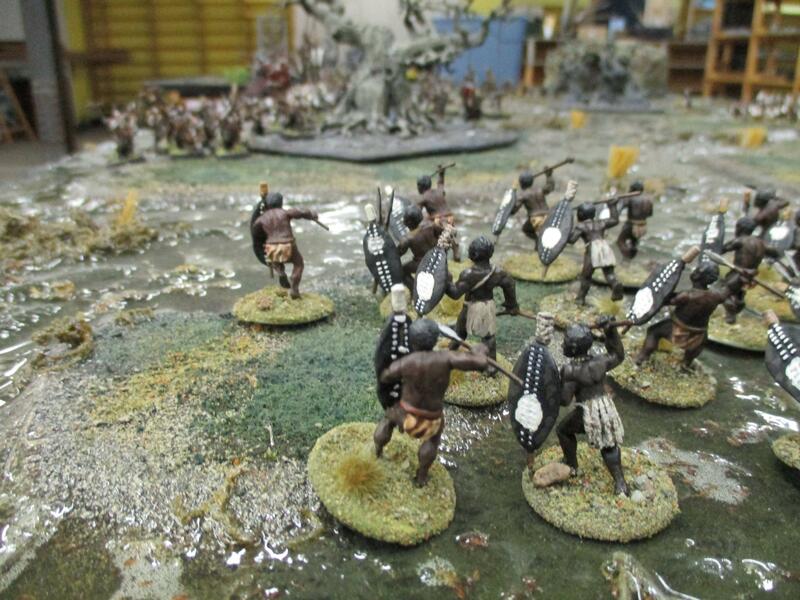 Sredni Vashtar urged his Liberators forward and the warriors moved into a grove of trees ahead of them. 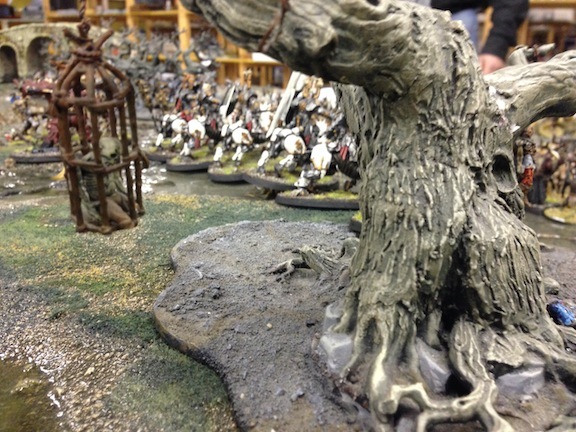 With this motion they became visible to the bloodbound forces and the Skullreapers surged forward to get to grips with an opponent worthy of them. The dead piled up around the Skullreapers and Khamtes followed up behind them smashing his axe into the chest of a Liberator. The chanting of Skirulus could be heard and as men died and sank beneath the murky water a dark energy could be seen radiating around him. His chant was low though, not many had fallen, the waist high water slowed not only movement but prevented warriors from using their full force in the attack. The charge of the skullreapers had left Ason-Har exposed and alone as he struggled through the muck. It was the opportunity that Sredni Vashtar was waiting for. 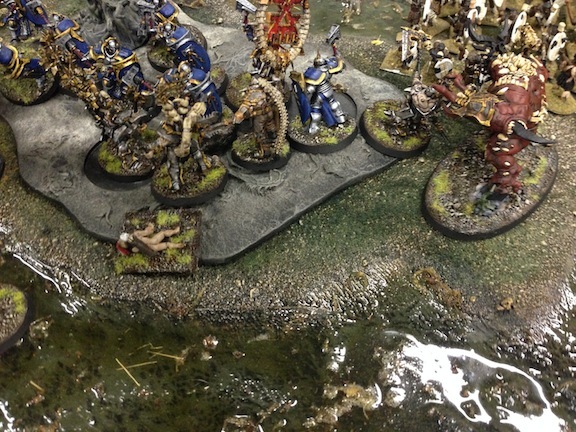 The attack of the Uluz had pried an opening in the Stormcast forces and the appearance of the Liberators had caused those closest to the Chaos lord to leave him. "Hammerfall, move forward, your target is there," said the Lord Celestant to his Retributors and they surged forward fueled by their hatred of Chaos. After giving the command Vashtar urged his dracoth forward into the ranks of the Skullreapers to help his faltering Liberators. Ason-Har would have been a match for a single Retributor or possibly a pair or three of them, but beset by five he quickly fell beneath the heavy blows of the two-handed hammers. As he fell the troops closest to him became confused and the word of his defeat spread rapidly through the army. The dragon ogres surged forward to try to recover the body of their lord. Skirulus the Tall intoned one might last note and a tortured scream rent the air as the blood from dozens of dead warriors snaked up through the muddy water and coalesced into the form of naked anger, of rage personified. 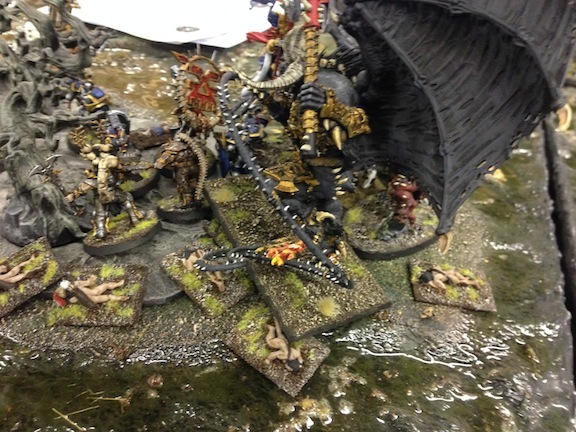 The Bloodthirster slammed into the Liberator's ranks allowing the skull reapers to extricate themselves and fall back. 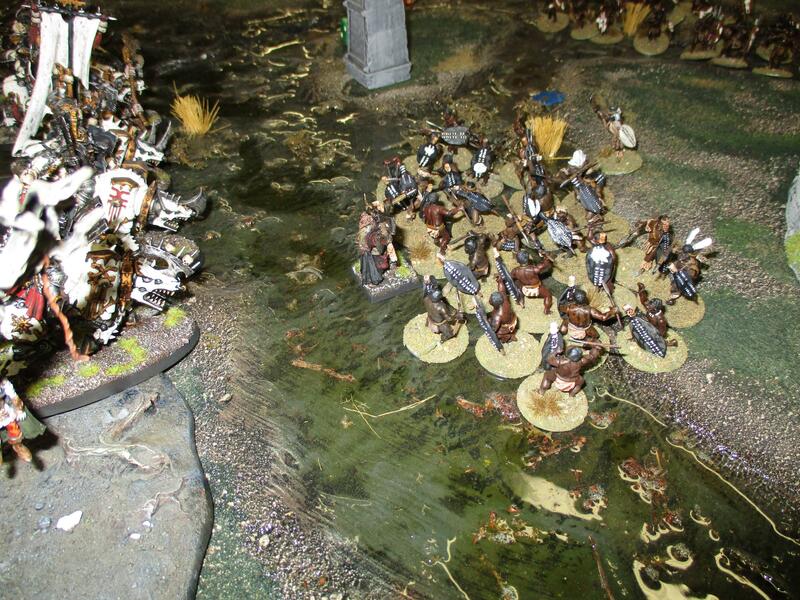 The rest of the army followed suit and withdrew from the combat. 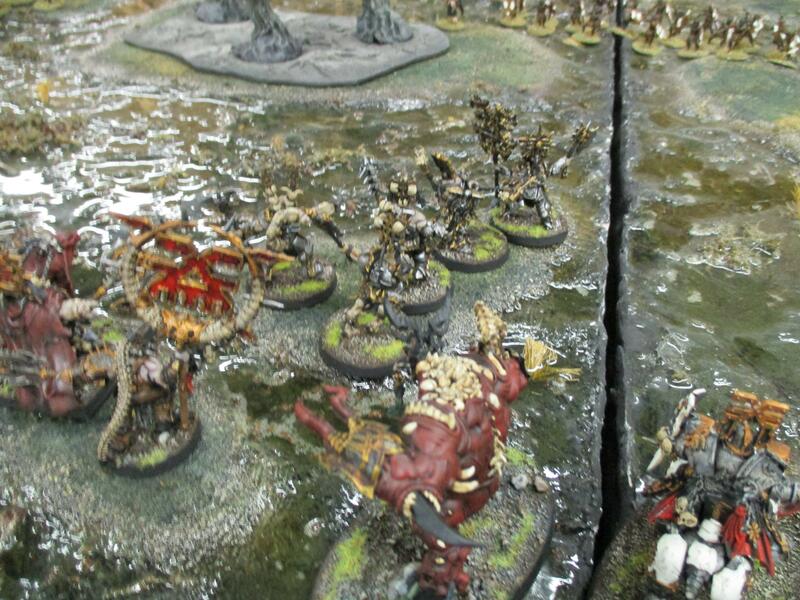 The bloodthirster inadvertently covering their retreat by distracting the Sigmarites and scaring off the Uluz. The Dragon Ogres had failed to recover the body of Ason-Har and had lost one of their number in the attempt. The Retributors let them go and rushed over to help Vashtar and the Liberators vanquish the great daemon of Chaos. I have no interest in Age of Sigmar, but the games/AAR you do are 1st rate. This is better than anything GW could do as the flavor you get from adding in other non-GW models in the counts as is just amazing. I do something similar for Clash on the Fringe for playing 40K. My DUST models look so nice as a PDF. I really enjoy these reports and that table is incredible!! I did this once with green jolly rancher candies by melting them. They looked the part but table only lasted for a few weeks before dust and my cat made some changes. Keep it up!! and thank you for sharing this and all the others. Thanks guys! I'm glad you liked it. I have an idea of the fluff and GW doesn't always make models to fill in the gaps. Plus I have a lot of historical figures. Other than Chaos marauders, who are pretty chaosy there aren't many simple barbarians there from GW and I wanted simple tribesmen for this with no Chaos theme. I was thinking about doing some PDF troops myself although I was looking at using some 20mm WWII Germans as they would be about the correct size next to space marines. I haven't decided yet though as I'm working through my Dark Eldar and second Betrayal At Calth boxed set at the moment. That ruined temple has seen some serious action on my tables too. I'd imagine it got used about once a week from 2001 to about 2003. Now it is in action again. 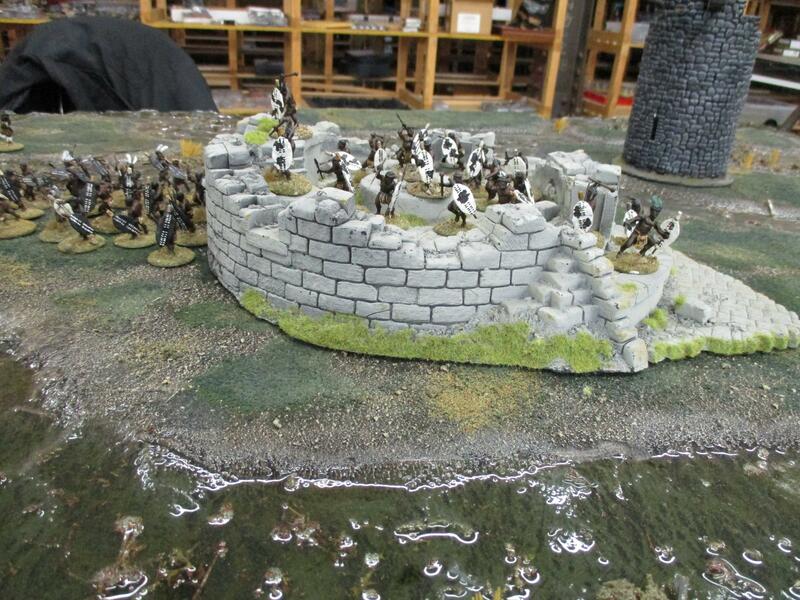 Pictors, I do have one question (and I'll probably ask MongooseMatt the same question), do you ever bother with the 'Mysterious Terrain' rules? 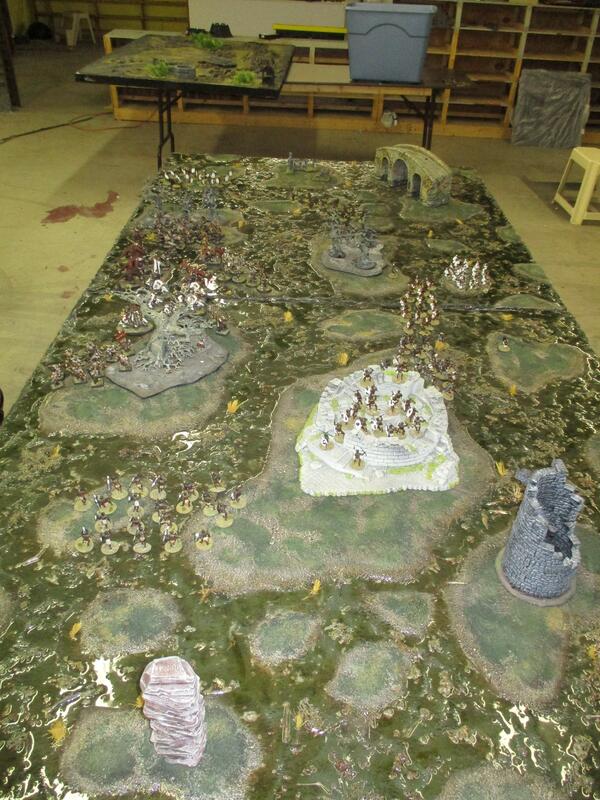 According to the AoS rules you are meant to roll for every piece of terrain on the table to see what effect it has but that seems excessive to me! I'd rather just treat most terrain as exactly that, terrain, and save the stuff that affects the game itself to specific pieces. As mentioned in the other thread, we don't use the terrain rules. Or we haven't yet. I think I left it out originally with the idea that I would just get the basic rules down and haven't added it back in. Anyway it seems like it would become too complicated. I'm certainly up for giving them a go sometime. Love your table. The swamp/ wetlands looks great. In the game, are the wet areas classified as rough errain or simialar? We did use them as rough terrain. The swampy areas were difficult to move through. 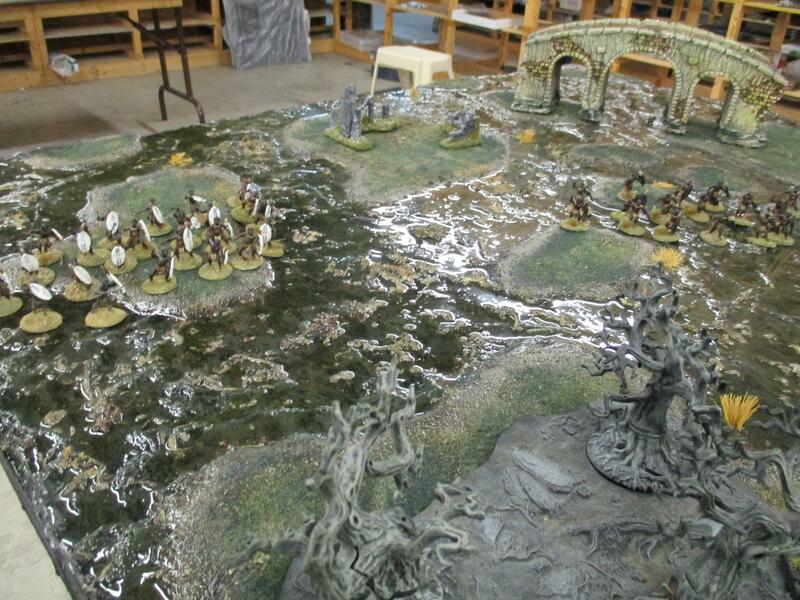 It made things difficult for the Chaos forces to get to grips with their enemy but it certainly was a cool looking table.